Powers: She possesses augmented strength but her main ability involves the generation of missiles and other projectiles from her chest chassis. 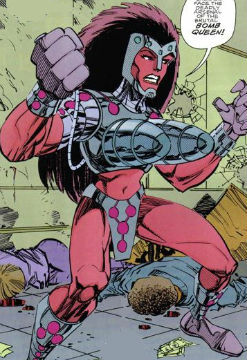 This villainess first appeared when she drew the attention of the Deadly Duo after she had stolen their team name. She was defeated on that occasion and later fled to New Port City where she took on the identity of that city’s ruler, Bomb Queen. Dragon convinced her to stand down and surrender to the authorities after she was overwhelmed by guilt regarding those she had killed.